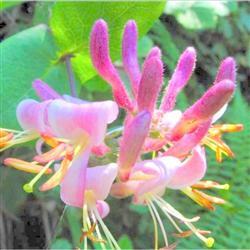 This deciduous climbing vine has showy pink flowers in spring and red berries in late summer. The dark green, oval leaves and fragrant honeysuckle blossoms make this and attractive choice for climbing up fences, posts, or tree trunks. Or use it as a groundcover for a partially shaded area. The berries are supposedly edible but we recommend leaving them to the birds that will flock around to feed on them.